I definitely found some momentum on this article. The first few days of the week, I needed to do some additional research and reading for the lit review because I was completely reframing the argument. I did the important but unglamorous work – and realized this was more than a revision, it was a complete and total overhaul. If you you compare this board to the first board, you will see two things. 1) I changed the tickets in the backlog for the article because I had decided to reshape the data section into short case studies. 2) “Collapse/deemphasize codes has been in WIP for several days – I was procrastinating on that one, just like I was procrastinating on “pull student quotes from interviews” last week. 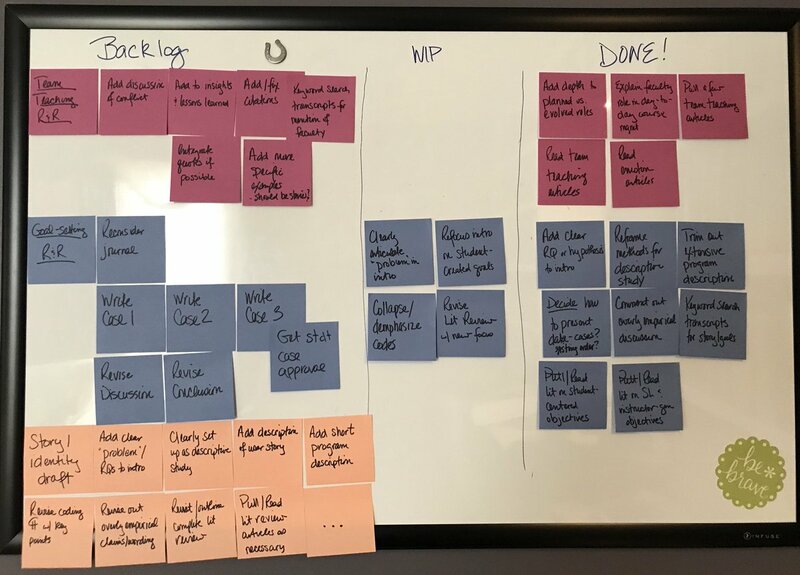 So 1) is good – be flexible as you go, that’s what sticky notes are for! And 2) is not good. If you don’t want to do it or are avoiding it, take it out of WIP until you can’t possibly ignore it any longer, OR rethink why you “have to” do it in the first place. It could just be that the ticket is too large and you need to break it up into smaller tasks. That annoying “collapse/deemphasize codes” ticket is still in WIP, really because I actually have to do it now that I’m ready to write the data section You’ll also notice two more things on this version of the board. 1) I changed my mind on the case studies in the data section and decided to go with chronological stages instead, more the way the original article was organized. This will be an easier edit and makes more sense given the way the lit review shaped up. And 2) there is a new set of sticky notes on the board. As I was reading for the team teaching article last week, I went on a little tangent in my reading that I thought was relevant at the time – student emotion in service-learning. That reading didn’t end up being applicable to the team teaching piece, but I found it really fascinating and illuminating in respect to another article I want to write that is further down the backlog. I am NOT starting a new article mid-sprint; being flexible should only go so far. 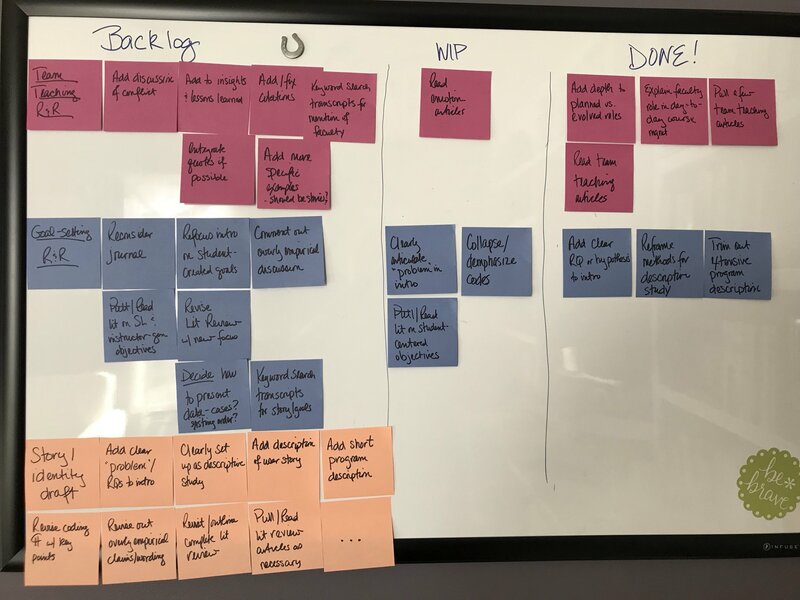 If you keep changing the backlog during a sprint, you’ll never complete anything. So I just put up a few notes of really minor things I can do if I need to change mental gears for a few minutes without totally getting out of the flow of writing. I also added one ticket to the team teaching WIP as well and for the same reason – something I just need to think about for a few minutes that won’t interrupt my larger focus. 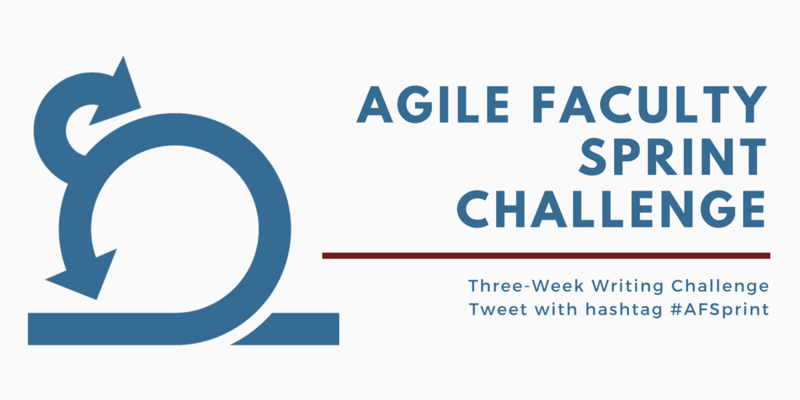 So that’s Week 2 of my first #AFSprint writing challenge. You can follow along during the week on Twitter using the hashtag #AFSprint. Follow me for other tips on applying Scrum and Agile to your faculty work, and take a deep dive by ordering my book, Agile Faculty: Practical Strategies for Managing Research, Service, and Teaching, available now from the University of Chicago Press – use the code PRAGILE for a 20% discount on the cover price!